Professional boxer Floyd "Money" Mayweather sent out a tweet on Tuesday night showing him and Warren Buffett squaring off in a prefight hype photo. Another tweeted announced "Warren Buffett the 66.9 Billion dollar man joins The Money Team," referring to Mayweather's company and brand. Mayweather has earned almost $400 million in the ring since turning pro in 1996, according to Forbes, including $105 million in the past year for two fights that lasted a total of 72 minutes. The 37-year-old Mayweather's record stands at 46-0, and he is a world champion in five divisions. Buffett recently provided $3 billion to finance Burger King's deal to take over the Canadian coffee-and-doughnut chain Tim Hortons. The 83-year-old's return on that cash will be 9%. 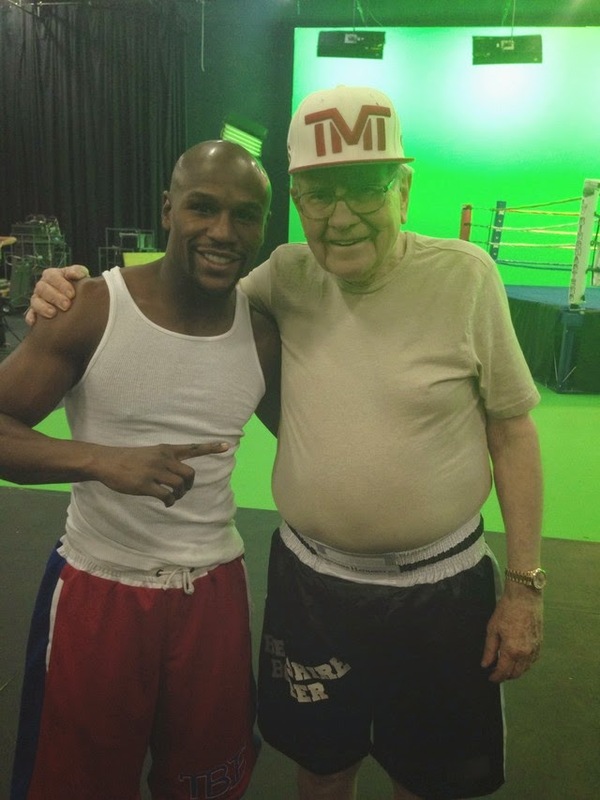 The photos of Mayweather and Buffett are glorious. The caption from the Instagram below reads: "It was such pleasure meeting @WarrenBufett when he came by @floydmayweather BOXING CLUB to show love & support to the champ."